Donning her signature pink hard hat each day, UIU alumna Lindsay Highland-Revelle is the “boots on the ground,” working alongside three employees and her husband, Bill Revelle Jr. The many facets of her company, LC Service and Supply of Festus, Mo., are the results of Highland-Revelle’s commitment and innovation to ensure its longevity in a competitive construction service and supply industry. Highland-Revelle says that’s where her psychology degree from Upper Iowa University comes in, and she’s able to handle herself fairly well in the male-dominated industry. Recruited to play soccer at UIU, the St. Charles, Mo., native was unsure of what she would do after college. Starting out as an athletic training major, Highland-Revelle switched to business, then computer programming, and finally psychology with a minor in criminal justice. She was also fully involved in life at the Fayette campus as a resident assistant in Garbee Hall, where she remembers another student trying to resolve an argument by bringing a machete into the dining hall. Highland-Revelle was also a member of the first group to join Beta Theta Omega sorority, and held two jobs, working at a gas station and DT’s Pub while competing on the women’s soccer team and staying on top of her coursework. After four years, and just shy of graduating, Highland-Revelle left Upper Iowa to marry and returned to the St. Louis area. She finished her bachelor’s degree through UIU’s self-paced program in 2007. After four years of marriage, Highland-Revelle divorced. At the time she was working for Revelle Trucking, and was searching for a change in her professional life. She wanted to start her own trucking and supply company. She took her idea to her then-employer, Bill Revelle Sr. He told her to go for it. Highland-Revelle applied for the federal disadvantaged business enterprise (DBE) program and the St. Louis area Women’s Business Enterprise (WBE) program, whose purpose is to grow businesses that are owned by minorities and women and ensure that these businesses have the maximum opportunity to participate in city contracts that are locally funded. The process to be certified is extensive and includes an in-person review process in front of a board of directors. LC Service and Supply is DBE certified in Missouri, as well as Texas and North Dakota. The year 2008 was challenging for construction firms across the country. Revelle Sr. went from having 30 trucks on the road to only eight. It wasn’t the best time to be starting out, but Highland-Revelle persevered and has now earned a reputation as an up-and-coming firm. 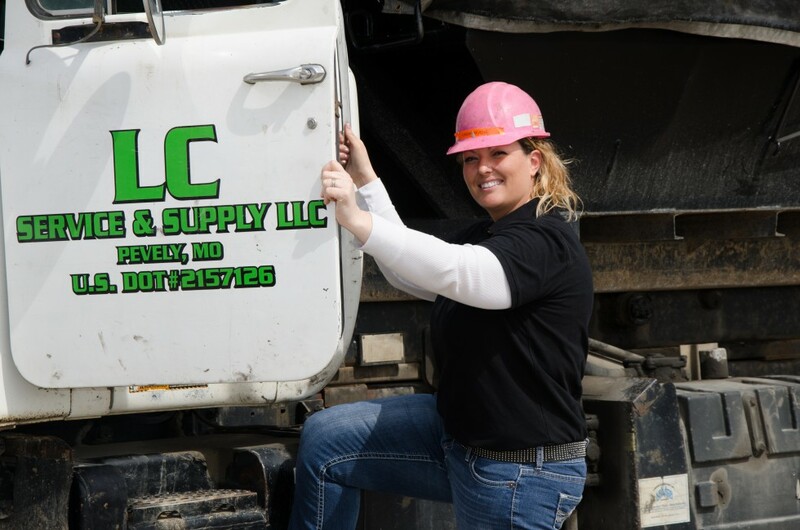 LC Service and Supply specializes in dump trucks, roll-off containers and water and sewer utility abandonment. It was recently approved as the only distributor in the St. Louis area of The Pink Cart, a collection container for which portions of every sale are donated to the American Cancer Society to help fund breast cancer research. In the beginning, Highland-Revelle brokered trucks from other companies. In 2010, she bought her first truck, and added two more a year later. In late 2012, Highland-Revelle acquired a roll-off container company adding 40 containers and one truck to the fleet. For the water and sewer utility abandonment portion of the company, Highland-Revelle and her husband travel all over the United States filling abandoned sewers with a mixture of fly ash, a byproduct of coal, and water. Termed “flowable fill,” it is an alternative to concrete. In the spring, the couple spent two weeks in Omaha applying the flowable fill to abandoned sewer lines beneath the botanical gardens that had been built on a former landfill site. She likes to joke that she, her husband and their family are together more than any family should be. Expanding that facet of her company is a goal of Highland-Revelle’s as she continues to grow LC Service and Supply. She is seeing a trend in the construction service industry as the younger generation is coming up in the ranks, and building positive relationships with her peers will only add to her success.